Yesterday was such an exhausting but fantastic day, My parents were down in London. So I met them for dim sum along with my sister and her bf. Next stop was Harrods then Chinatown where I had to then rush off to the Garnier Event for 6pm. It didnt help that London was all hot and sweaty and the tube was HELL! yuk! 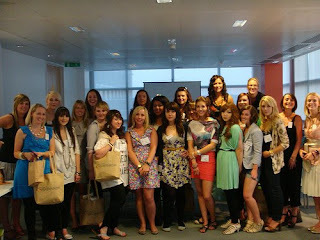 The team were so nice and extremely generous and we all walked away with a huge amount of goodies. 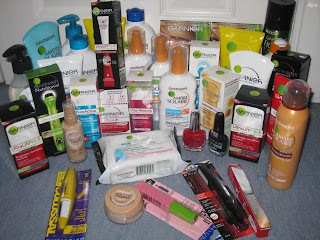 There was allsorts of products including, skincare, bodycare, suncare, haircare, hairdye and also a few pieces from Maybelline. Aww your parents are so cute! You looked amazing for someone that had a long, exhausting and hot day!! I really hope we get the new Garnier Pure Active range in Australia soon.. all these blog posts on it have convinced me that I NEED it now! Oops.. I wish you could edit comments haha. I just found out we already have the range in Australia! Yay, I can go out and buy some tomorrow!! so lucky! you UK girls have it all!! awww lovely photos! i love your hair! and wow did you buy all of that?! wow lots nice stuff! Are you planning to review any of those? the goody bag seems so full and wonderful! That is one heavy goodie bag!!! This new line sounds great, I've got to check if it's released at my place or not!